The main reason why you travel to the Galapagos Islands is to experience the islands and their unique wildlife. 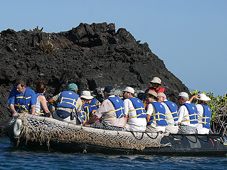 We have specially designed your programs in such a way that they allow you to perceive Galapagos from different perspectives and take out the animal lover in everyone of us, activities like: guided hikes, relaxing beach walks, snorkeling and swimming! 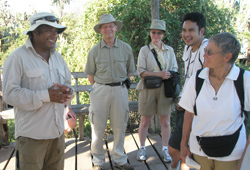 The islands are visited twice a day and always involve a leisurely hike in a small group led by your own naturalist guides category 3, allowing you to experience close encounters with nature. Established as an ecological park to help protect it from human destruction and abuse, the Islands are now viewed only by guided daily expeditions. As a traveler, your lifestyle is luxurious. Staying aboard a ship such as the Silver Galapagos for a grand cruise liner experience in the evenings and traveling to different islands with expert naturalist guides by day. The Silver Galapagos is a full-service cruise ship on a scale small enough to navigate through the archipelago of the Galapagos. On board, you will find every luxury detail you are familiar with from far larger transcontinental cruise ships, including the renovated balcony suites. Cabins are spacious ( 250 sqfeet average ) with many amenities. Every one has a TV, a phone for international calls, a private bath with marble vanity and a hairdryer. Each cabin also has full air conditioning and temperature control. In the cabin, you will find a workspace for reviewing your day's travels or referencing field guides for information about wild life in the Galapagos Islands. Enjoy views of the islands from the lounge and bar areas on the main deck of the Silver Galapagos. Relaxing in the ship's library, you can read books about the islands and their natural history, extensive maps and charts, contemporary literature, and an extensive collection of the classics. The library also houses the video collection for you to watch in your cabin. The kitchen on-board creates exciting selections three meals a day. Breakfast and lunch are buffet style and offer both local and international dishes. Lunch is usually served on deck to take advantage of the beautiful mid-day weather. A more upscale seated dinner is served every night in the dining room. am: Bachas Beach, Santa Cruz Island and transfer to the airport of Baltra for your flight to mainland. am: Interpretation Center, San Cristobal Island and transfer to the airport for your flight to mainland. am: Baltra Island and transfer to the airport for your flight to mainland.